Mexican police have freed more than 100 people unharmed after a jet flying from Cancun to Mexico City was hijacked by a man claiming to be on a divine mission. Bolivian-born Jose Flores Pereira threatened to blow up the plane unless he could warn Mexican President Felipe Calderon of an "impending earthquake". Mr Flores told flight attendants that a canned drink he had was a bomb. 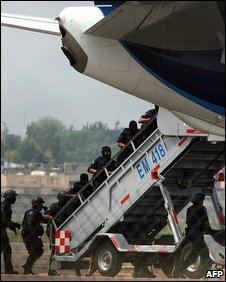 Police stormed the Aeromexico plane after it had landed in Mexico City and women and children were allowed off. Several people were initially arrested and taken away in handcuffs as Mr Flores said he had accomplices, but police later said there had been only one hijacker and no bombs on board. Public Safety Secretary Genaro Garcia Luna said Mr Flores, who told police he was a Protestant pastor, carried out the hijacking after having "a revelation that Mexico was facing a great danger, and was threatened by an earthquake". Mr Flores told reporters after his arrest that he had used "a juice can with some little lights I attached" to seize control of the plane as it was coming in to land. Some of the passengers, who included French and US nationals, said they were not initially aware of what was happening. Flores had told flight attendants that he had three accomplices, "the Father, Son and Holy Ghost". He said that he acted on 9 September 2009, because the numbers 9/9/9 were the inverse of 6/6/6, the number linked to the Anti-Christ. "Christ is coming soon," Mr Flores told journalists. Mr Garcia said that Mr Flores was a former drug addict, with a conviction for armed robbery in his native Bolivia, who has lived in Mexico for 17 years. 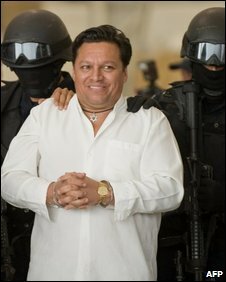 Mr Flores, who is also a singer, said he had gone to Cancun to preach. "I was a despicable drug addict, but Christ freed me a few years ago," he sings in one video posted on YouTube. Other videos show him shooting at a coin he throws in the air. An official told the BBC while the hijacking was taking place that President Calderon had been on his way to the airport. 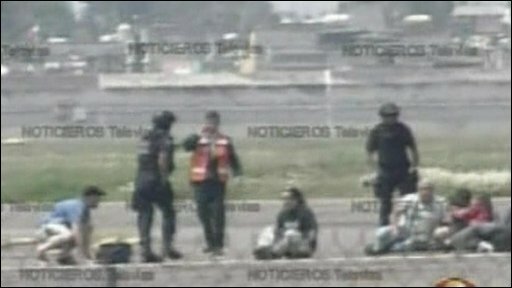 Mexican media broadcast live images of the drama unfolding as the plane sat at the end of the runway and passengers were seen disembarking and being led away. Passenger Rocio Garcia told the Televisa TV network that the crew announced the plane was being hijacked when it landed in Mexico City. "These were scary moments," she said. "My whole life flashed before me," said another passenger, Maria Fernanda Vega.